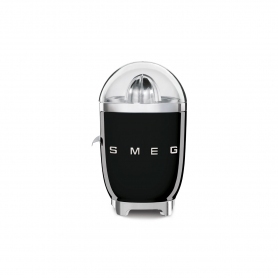 Curved, compact and built to squeeze every last drop, the CJF01 from Smeg makes citrus juicing effortless. This Smeg citrus juicer will squeeze both large and small fruits with ease. Whether you are juicing lemons, limes, oranges or grapefruits, you’ll be able to do so quickly, without having to change attachments. A built-in sensor and automatic on/off function let you make delicious, fresh and healthy juices in seconds. Simply press the fruit onto the reamer, and the 70 W high performance motor will kick in, rotating the reamer and extracting the juice. When you are done, lift off the fruit, and the reamer will stop automatically. And, you won’t have to worry about any residue on your kitchen units – the CJF01’s integrated anti-drip spout will dispense the juice into your glass directly. 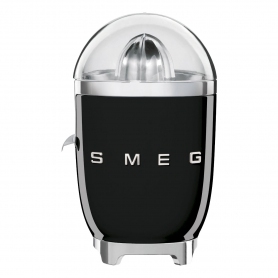 Smeg has designed this citrus juicer with durability in mind. 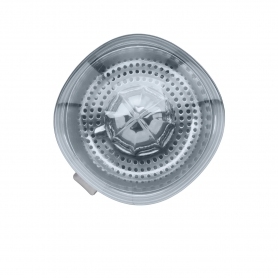 The reamer, strainer and spout are all made from anti-corrosive stainless steel, while the removable lid and bowl are made from Tritan™ BPA free plastic. The lid is even coated with die-cast aluminium powder to make it stronger. Cleaning small appliances can often be a chore, but thankfully, the CJF01 is different. 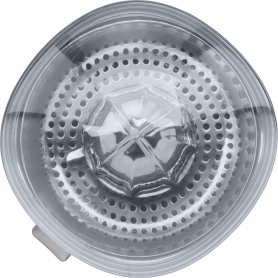 The lid, strainer and juicing bowl are all removable and dishwasher-safe, which makes cleaning hassle-free. It’s also easy to clean the reamer, which just needs a quick wash with hot, soapy water. This 50’s style citrus juicer will add a splash of colour to your kitchen – it is available in cream, pastel blue, red and black. It joins Smeg’s iconic small appliances range, which includes kettles, toasters, blenders, stand-mixers, slow juicers and coffee machines. 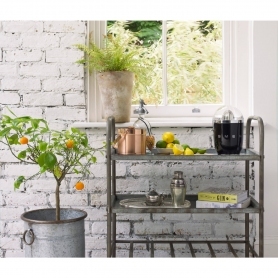 Make fresh, healthy juices in seconds with the Smeg CJF01 Citrus Juicer. Order yours today.